Kent County residents now have an option for safe disposal of used needles. Kent County residents now have an option for safe disposal of used needles. 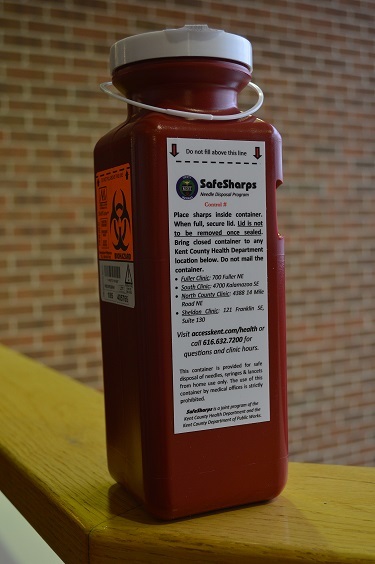 The Kent County Department of Public Works (KCDPW) and the Kent County Health Department (KCHD) are teaming up to ensure safe, confidential disposal of needles, lancets and other home medical ‘sharps’ through the SafeSharps Program. “Sharps” is the term for medical devices with sharp points or edges that can puncture or cut skin. If placed in the trash, these items can injure you, your family or others who will handle your trash. Used sharps can transmit deadly diseases, such as HIV and hepatitis. Kent County residents can stop into any Kent County Health Department clinic to pick up an approved container to take home. Once full, the container should be returned to any of the four clinics. There is no cost to you participate in this program! To keep clinic staff safe, safety reasons, the clinics will not accept sharps in any other containers. These items are NOT accepted in curbside recycling and should NOT be placed in the trash.